Continuing our series on walking around the capital, in partnership with Walk London. The Green Chain Walk opens up some 50 miles of south-east London in a leafy ramble through ancient woods and open spaces. The 'chain' links around 300 verdant oases on a looping journey from the Thames Barrier to the Victorian Gothic of Nunhead Cemetery. This weekend offers an excellent chance to discover some of the finest sections of the walk. On Sunday, the Virgin London Marathon sets off from Greenwich and Blackheath from 9.20am. The start is always a spectacle, with thousands of excited runners embarking on their 26-mile challenge beneath assorted hot air balloons and kites. Watching the race get under way is the perfect inspiration to set off on your own morning of outdoor exercise — albeit of a gentler nature. After the runners have departed, head towards the high ground to the east. This is Shooters Hill, one of the loftiest vantage points around London. Use a map to guide you up past Woolwich Common and on towards our starting point in Oxleas Woods. If the roads are still busy with marathon spectators, you should be able to find a reasonably direct alternative through the side streets. Oxleas Woods is one of the few remaining sections of an 8,000-year old deciduous forest, which crowns Shooters Hill. It is among the most atmospheric places in London, with dark canopies and spectacular views from the fringes. 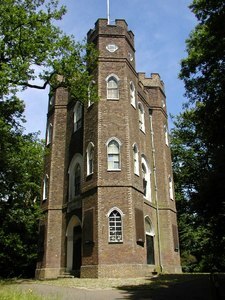 Be sure to seek out Severndroog Castle, an unusual 18th Century folly. Picking up Green Chain Walk Section 3, a pleasant amble through the woods brings you out onto the busy Dover Road, an old Roman route as you'll be able to see from its straight line. Across the road, you'll pass alongside Woodlands Farm, and worth a visit in its own right. Look out for the spring lambs. The walk then leads us to the broad but sometimes rather bleak East Wickham Open Space, a mixture of meadows and oak woods. The route finishes with a walk alongside Bostall Woods, once the haunt of highwaymen who would menace travellers on the Dover Road. A small tunnel in the parkland, named Turpin's Cave, is probably of 19th Century origin, however. From here, you can continue the Green Chain Walk via Section 2, which will take you past the remains of Lesnes Abbey and on to transport links at Erith. Or head north onto Longleigh Lane to catch the 99 bus to Plumstead rail station. Walk London's Guide to the Green Chain Walk can be found here, with a map of Section 3 here.